For many cancer survivors the treatments impact the lymphatic system, part of the circulatory system that is vital for immune function. Lymphedema is caused by a blockage of lymphatic system, and it is a long-term condition where excess fluid collects in tissues causing swelling (edema). Exercise is an important tool in managing and preventing lymphedema, and we will cover top exercises that can help. Prior to beginning these exercises, clients should start with a five-minute aerobic warm-up. As they begin each of the following exercises make sure to take several deep abdominal breaths (as were described earlier). Pelvic tilt – have your client/patient lie on their back with their knees bent and feet flat on the floor. Have them tilt their hips so that they are able to press the small of their back against the floor. Have them pause for several seconds then release the contraction. Repeat 5-10 times. 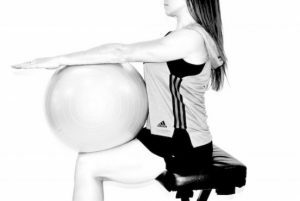 **If your client/patient has a bad neck they can place a 55cm exercise ball on their stomach and against their bent legs. Keeping their arms straight and reaching toward ceiling, and their head relaxed on the floor, they should engage their abdominal muscles and press their arms against the ball. They can repeat this as many times as they can comfortably. This can also be done sitting upright in a chair (only the ball will be on their lap and their arms will be parallel to the floor) for someone who is unable to get to the ground. Neck stretches – refer to the neck stretches in the stretching section. These stretches can be done by the client/patient, or with assistance from the CES. Shoulder shrugs – have your client/patient shrug both shoulders, lifting them towards their ears as they inhale. Have them exhale, and depress their shoulders as low as they can (attempting to reach the floor with their fingertips) then return to a relaxed position. Repeat 5-10 times. Shoulder rolls – have your client/patient lift their shoulders up to the ears then rotate the shoulders back and down, making a smooth, continuous motion. Repeat 5-10 in each direction. Isometric shoulder blade squeeze – have your client/patient bend their elbows at 45-90 degrees out at their sides (parallel to the floor). Have them exhale and pull them towards the center of your back, squeezing the shoulder blades together. Pause. Have them inhale and return to starting position. Repeat 5-10 times. Isometric chest-press – have your client/patient place the palms of their hands together, with their elbows bent and arms at or below shoulder level. Have them exhale and push their hands firmly together. Pause. Have them inhale and relax. Repeat 5-10 times. Shoulder circles – have your client/patient hold their arms at or below shoulder height with their palms facing down. Have them make small circles with their arms (keeping arms elevated). Repeat 5-10 times in each direction. Wrist circles – have your client/patient hold their arms overhead and rotate their fist in small circles, isolating the movement to the wrist only. Rotate 5-10 times in each direction. Wrist flexion and extension – have your client/patient hold their arms overhead and flex and extend their wrists, isolating the movement to the wrist only. Repeat 5-10 times. Fist clench – have your client/patient hold their arms overhead and open their hands and stretch their fingers, spreading them apart. Then have them slowly clench each hand to make a fist. Pause. Repeat 5-10 times. Modified sit-up – have your client/patient lie on their back with their knees bent and feet flat on the floor. Instruct them to maintain a neutral pelvis. Have them keep their neck in neutral and their chin pointing to the ceiling. As they exhale, have them lift up their chest and shoulders, pausing when they feel their abdominal muscles tighten up. Have them slowly lower themselves back to starting position (trying not to rest between repetitions). Repeat as many times as they can comfortably. Bicycles – have your client/patient lie on their back with their knees bent at ninety degrees (shins are parallel to the floor). Instruct them to maintain a neutral pelvis and keep their upper body relaxed on the floor. They should raise their legs towards the ceiling, keeping the legs bent at about 45 degrees. Have them circle their legs like a bicycle 5-10 in each direction. Leg circles – have your client/patient lie on their back with left knee bent and foot on floor and right leg extended up toward the ceiling. Have them engage their abdominal muscles and “anchor” their hips to the floor as they perform clockwise and counter-clockwise hip circumduction, using very small and controlled movements, 5-10 times in each direction. Have them repeat the entire process on the other leg. Knee flexion/extension – have your client/patient lie on their back with both legs extended up toward the ceiling. Have them bend and extend their legs leg 5-10 times at the knees. Plantar/dorsi flexion – have your client/patient lie on their back with both legs extended up toward the ceiling. Have them point and flex their feet at the ankle joint 5-10 times.